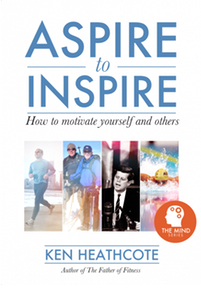 Ken Heathcote is a fitness industry pioneer with over 50 years experience in training, motivational speaking and business. Welcome to my website. Here you can find information about my books, the autobiographical Father of Fitness and my on-going series of motivation digital ebooks called The Mind Series, the first of which, Aspire to Inspire, is available on Amazon Kindle now. Use the menu at the top of the page to find out about me, my history, my books and my motivational speaking. My autobiography Father of Fitness is available on Amazon in paperback form. A Kindle version will be released soon.